DescriptionPetit Terraillon classical bottle warmer. Very simple to use, this bottle warmer will make your stay with baby easier wherever you're staying (rented flat, hotel, friends, relatives..). It will particularly help in a hotel for example (no need to get to the reception to get baby's bottle or food warmed up by the hotel staff). 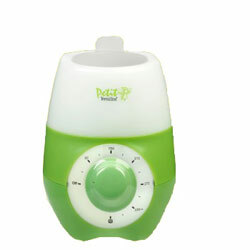 And as for all our baby gear rental, this bottle warmer will be delivered to your doorstep. Rebecca from the UK: "For over a decade I have been visiting Paris at least once a year. After being blessed this year with a baby I was worried how I would manage to get all my baby's needs (only 4 months old for first visit) transported from home to the apartment in the centre of Paris. I didn't want to break the tradition of visiting the Christmas markets with my Mother. By chance I came across Baby'tems. What a fantastic service, I kept my luggage light by ordering nappies, baby wipes, bottle steriliser, bottle warmer, bouncy seat and changing unit. Delivery and collection was friendly and efficient, everything was clean, easy to use and in perfect condition. Will be using Baby'tems again next year. Thank you."